Democracy is embedded at the school. Children are always listened to by adults and are taught to listen carefully and with concern to each other, respecting the right of every individual to have their opinions and voices heard. Pupils also have the opportunity to air their opinions and ideas through our Pupil Voice and regular questionnaires. . Pupil voice work not only to solve issues that the children raise but also have input into their curriculum and the standards of the school. North Road is becoming increasingly culturally diverse, therefore we place a great emphasis on promoting diversity with the children. 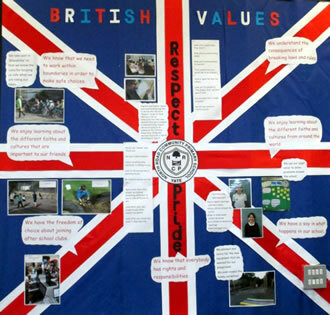 Assemblies are regularly planned to address this issue either directly or through the inclusion of stories and celebrations from a variety of faiths and cultures. Our RE and PSHE teaching reinforce this. Members of different faiths or religions are encouraged to share their knowledge to enhance learning within classes and the school. Children visit places of worship that are important to different faiths. Through this our children gain an enhanced understanding of their place in a culturally diverse society.